The 412th Test Wing (412 TW) is a wing of the United States Air Force, assigned to the Air Force Test Center at Edwards Air Force Base, California. The 412th Test Wing plans, conducts, analyzes, and reports on all flight and ground testing of aircraft, weapons systems, software and components as well as modeling and simulation for the USAF. It is also the host wing for Edwards Air Force Base, Calif. - the 2nd largest base in the Air Force. The wing oversees base day-to-day operations and provides support for over 10,000 military, federal civilian and contract personnel assigned to a 470 square mile installation. Approximately 1500 Test Wing Desert Warriors directly support the test and evaluation mission of the Air Force Test Center and the 412th Test Wing. The wing is responsible for operating the base, including the infrastructure, communication systems, security, fire protection, transportation, supply, finance, contracting, legal services, personnel and manpower support, housing, education, chapel and quality of life programs on a 301,000-acre base in the middle of the Mojave Desert, the second largest base in the U.S. Air Force. The 412th TW is host to over 100,000 visitors annually and supports over 25,000 dependents, retirees, and veterans. Major units within the wing include the 412th Mission Support and the 412th Medical Groups, as well the 412th Civil Engineer/Transportation Directorate, 412th Security Forces Squadron and the Services and Comptroller Divisions. Staff agencies include chaplain services, base comptroller, inspector general, manpower and organization, and military equal opportunity and public affairs. Flying units under the Operations Group are called flight test squadrons and the squadron commander also usually fulfills the role of Combined Test Force, or CTF, Director. The CTF is an organizational construct that brings together the government developmental test and evaluation personnel (i.e., military personnel and government civilians and support contractors), the operational testers or representatives of the warfighters who will eventually employ the aerospace system in combat, and the contractors who develop and test the aerospace system. Members of the CTF formulate the test program, develop the criteria for flight test missions, execute flight test missions, analyze data from the test flights and report on the results. The CTF military personnel, government civilians, and contractors all work together as a team. This concept enables a cheaper, faster, and more effective test program and produces a more effective aerospace system for the warfighter. Risk is an accepted component of flight testing, but because of Edwards' benchmark flight test safety processes, the center maintains a stellar safety record. The AFTC's mission focuses on Developmental Test and Evaluation which is the process used to identify risks that need to be reduced or eliminated before fielding new systems. Once DT&E is accomplished, aircraft systems transition to Initial Operational Test and Evaluation, or IOT&E where the aircraft is evaluated for combat effectiveness and suitability for an intended mission. The 412th Engineering and the 412th Electronic Warfare Groups provide the central components in the conduct of the Test and Evaluation mission. They provide the tools, talent and equipment for the core disciplines of aircraft structures, propulsion, avionics and electronic warfare evaluation of the latest weapon system technologies. They are also host to the core facilities that enable flight and ground test with the Range Division, Benefield Anechoic Facility, Integrated Flight Avionics Systems Test Facility and the Air Force Electronic Warfare Evaluation Simulator. Through a maintenance group of over 2,000 people and an operations group of 3,000, the 412th Test Wing maintains and flies an average of 90 aircraft with upwards of 30 different aircraft designs and performs over 7,400 missions (over 1,900 test missions) on an annual basis. Rounding out the test wing are the Project and Resource Management Divisions who provide the foundation for the successful program management of test missions. The Test Pilot School, also part of the test wing, is where the Air Force's top pilots, navigators and engineers learn how to conduct flight tests and generate the data needed to carry out test missions. Human lives and millions of dollars depend upon how carefully a test mission is planned and flown. The comprehensive curriculum of Test Pilot School is fundamental to the success of flight test and evaluation. The 412th Test Wing's origins can be traced to 29 November 1943 when the 412th Fighter Group was activated at Muroc Army Air Field, California. Testing of the Bell P-59 Airacomet jet fighter was being conducted at a site on the north shore of Rogers Dry Lakebed, about six miles away from the training base at Muroc. The group remained a headquarters only until 11 March 1944 when the 445th Fighter Squadron was assigned to begin flying the Airacomet for operational testing. In June, the group moved to Palmdale Army Air Field, California and was brought up to full strength in the summer, when the 29th and 31st Fighter Squadrons were assigned. Its original mission was to conduct tests and engage in experimental aircraft work as part of IV Fighter Command. The 412th was the first American jet fighter group to be activated. The P-59A was shortly joined by a second jet fighter, the Lockheed XP-80 Shooting Star. As with virtually all of the test programs conducted during the war years, most of the initial flight test work on the XP-59 had been conducted by the contractor. The group developed training programs and trained aircrew and ground personnel as cadres for newly formed jet aircraft-equipped units. Problems with the planes' Allison J33 engines kept the group's Shooting Stars grounded through part of 1945, and the plan's accident rate was twice that of any other fighter in the Army Air Forces inventory. 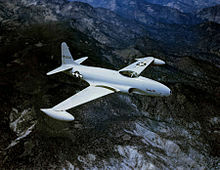 In November 1945, the group moved to March Field, California, where the 39th Photographic Reconnaissance Squadron was attached to it to begin testing the P-80 as a reconnaissance aircraft. The group was inactivated on 3 July 1946 and its mission, personnel and jet aircraft were transferred to the 1st Fighter Group. On 18 August 1955 the 412th Fighter Group (Air Defense) was activated by Air Defense Command (ADC) at Wurtsmith Air Force Base, Michigan, where it assumed the mission, personnel and equipment of the 527th Air Defense Group, which was simultaneously inactivated. This action was part of ADC's Project Arrow, which was designed to bring back on the active list the fighter units which had compiled memorable records in the two world wars. The 445th Fighter-Interceptor Squadron moved from Geiger Field, Washington and assumed the Northrop F-89D Scorpions of the 527th's 87th Fighter-Interceptor Squadron, since Project Arrow also reunited fighter squadrons with their traditional group headquarters. These two seat interceptor aircraft were radar equipped and armed with Mighty Mouse rockets. The 412th was also assigned several support organizations as the host for active duty USAF units at Wurtsmith. The mission of the group was the air defense of the Upper Great Lakes region. In March 1956 the group's 445th Squadron became the first unit in ADC to convert to the F-89H, which could carry the GAR-1 Falcon in addition to Mighty Mouse rockets. The squadron soon upgraded to the F-89J. On 1 January 1957 the 412th became one of the first two groups in ADC to place its F-89Js armed with 2 nuclear MB-1 Genie missiles, one under each wing, on alert. These aircraft were on thirty-minute “standby alert” in addition to the 412th’s requirement to maintain aircraft on five-minute alert armed with conventional weapons. Alert aircraft armed with Genies could not be launched to identify unknown aircraft unless at DEFCON 1. On 8 June 1956 the group expanded when a second fighter squadron, the 31st Fighter-Interceptor Squadron was activated. The 31st flew the single seat Convair F-102 Delta Dagger, which, like the later model F-89s of the 445th, was equipped with data link for interception control through the Semi-Automatic Ground Environment system. However the 31st remained at Wurtsmith only briefly, before swapping places with the 18th Fighter-Interceptor Squadron and moving to Elmendorf Air Force Base, Alaska on 20 August 1957, while the 18th moved from Ladd Air Force Base, Alaska to Wurtsmith. Strategic Air Command (SAC) believed its bases with large concentrations of Boeing B-52 Stratofortress bombers made attractive targets for Soviet missiles. SAC’s response was to break up its wings and scatter their aircraft over a larger number of bases, thus making it more difficult for the Soviet Union to knock out the entire fleet with a surprise first strike. As part of this dispersal, SAC established the 4026th Strategic Wing at Wurtsmith in 1958 and the base expanded to accept bombers and tankers. 1960 saw a series of changes for the group. In January, the 445th Squadron traded its Scorpions for supersonic McDonnell F-101 Voodoos. SAC's expanding mission saw the transfer of Wursmith to its jurisdiction on 1 April, along with all support units. The impending move of the 18th Fighter-Interceptor Squadron to Grand Forks Air Force Base would leave only one fighter squadron on the base. As a result the 412th Fighter Group was inactivated and the 445th Fighter-Interceptor Squadron was reassigned to the Sault Sainte Marie Air Defense Sector. In the late 1970s, the Wing flew flight tests on the F-15C Eagle with its advanced engine and fire-control system; the single-engine F-16C Fighting Falcon with its revolutionary, "fly-by-wire" flight control system; and the Rockwell B-1A and the later B-1B Lancer in the 1980s with its multitude of highly sophisticated offensive and defensive systems. These planes more than bore out the prophecy concerning the ever-increasing importance of systems testing and integration. At a remote location in 1978 and 1979, an AFFTC test pilot and a pair of flight test engineers were engaged in proof-of-concept testing with Lockheed's "low-observable" technology demonstrator, dubbed "Have Blue." The successful conduct of these tests led immediately to the development of a new subsonic attack aircraft that was designated the F-117A Nighthawk. The wing performed free-flight testing of the Space Transportation System (STS) for NASA from 1978–1980, and in April 1981 recovered the shuttle Columbia following the first-ever orbital mission of a reusable spacecraft. The wing continues to provide an alternate landing site services for STS recovery, most recently for the Atlantis during its STS-117 mission. The dual-role F-15E Strike Eagle was developed in the 1980s and went on to demonstrate remarkable combat effectiveness in the 1991 Persian Gulf conflict. The Low Altitude Navigation and Targeting Infrared for Night, or LANTIRN, system revolutionized air-to-ground combat operations during the Gulf War by the same conflict by denying Saddam Hussein's forces the once comforting sanctuary of night. The wing deployed support personnel and equipment to Southwest Asia for Operation Desert Shield and Operation Desert Storm from, August 1990-March 1991. While deployed, it performed tests on radar and weapons system accuracy. The late 1980s also witnessed the arrival of the first giant flying wing to soar over the base in nearly 40 years. The thin silhouette, compound curves and other low-observable characteristics of the B-2 Spirit bomber represented third-generation stealth technology, following the SR-71 and F-117. In June 1992, Air Force Systems Command was inactivated, being replaced by Air Force Materiel Command (AFMC). 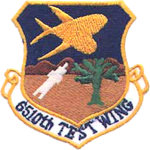 AFMC replaced the 4-digit AFSC 6510th Test Wing on 2 October 1992 by reactivating the 412th Test Wing, which assumed the mission, personnel and equipment of the 6510th. The 412th also was consolidated with the 6510th, which preserved the history and honors of the provisional AFSC unit since its establishment in 1978. 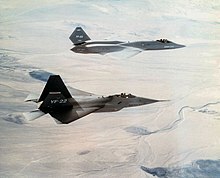 In the early 1990s, AFSC received YF-22A and the YF-23A Advanced Tactical Fighters. The two prototype fighters were the first airplanes to blend stealth technology with agility and high-speed, supersonic cruise capability. The YF-22A was selected to become the Air Force's new advanced tactical fighter after a brief demonstration and validation risk reduction flight test program. Now named the Raptor, the F-22A continues to undergo test and evaluation by the Wing's 411th Flight Test Squadron. A new group of research projects came to the 412th TW in the 1990s. RQ-4 Global Hawk, an unmanned aerial vehicle that has been used extensively in Operation Enduring Freedom (Afghanistan) and Operation Iraqi Freedom (Iraq), made its first flight at Edwards in February 1998 and has gone on to fill a critical role in the Global War on Terrorism. The Martin Marietta X-24A, Lockheed Martin X-33, Orbital Sciences X-34 and X-38 Space Station Crew Return Vehicle, a series of new lifting bodies, technology demonstrators and half-scale models that might make space flight, research and development safer and more economical, were tested at Edwards by NASA. Other projects of the 412th included XF-35A Lightning II and Boeing X-32, competing models for the Joint Strike Fighter program, made their first flights in September and October 2000. The X-35A won the competition in 2001 and will eventually be built in various versions for America's flying armed services and for foreign air forces as well. Also new are the Airborne Laser Program and several Unmanned Aerial Vehicle Programs. ^ Aircraft is Convair F-102A-80-CO Delta Dagger serial 56-1440. Taken in 1957 at Wurtsmuth AFB, Michigan. ^ This aircraft is the first USAF F-4 Phantom II, McDonnell F-4C-15-MC Phantom serial 63-7407. Shown about 1990 just before its retirement. ^ Aircraft is McDonnell Douglas F-15B Eagle serial 76-132. In 20016 it was transferred in 2006 to the 46th Test Wing at Eglin AFB, Florida. ^ Over 4,000 production F-16s were built after the competition. The YF-17 was the basis for the highly successful United States Navy F/A-18 Hornet. ^ a b c d e f g h i Bailey, Carl E. (28 December 2007). "Factsheet 412 Test Wing (USAFE)". Air Force Historical Research Agency. Archived from the original on 27 September 2015. Retrieved 30 August 2015. ^ a b c d e f g h i j k "412th Test Wing Fact Sheet". Edwards Air Force Base Public Affairs. 26 November 2014. Retrieved 28 August 2015. ^ a b c d e f "Edwards AFB units". Edwards Air Force Base Public Affairs. Archived from the original on 23 September 2015. Retrieved 28 August 2015. Knaack, Marcelle Size (1978). Encyclopedia of US Air Force Aircraft and Missile Systems (PDF). Vol. 1, Post-World War II Fighters 1945-1973. Washington, DC: Office of Air Force History.